It’s a common story when real life treasures are found in the trash but this one takes the punch/pow/zoink! Rare first edition comic books are destroyed inadvertently. Andrew Vickers created the sculpture “Paperboy” from a found box of discarded comic books. Vickers said he found the box years ago in the trash and he had no intention to use them until he learned of an art show. The comics became inspiration and layered material for his life size sculpture. 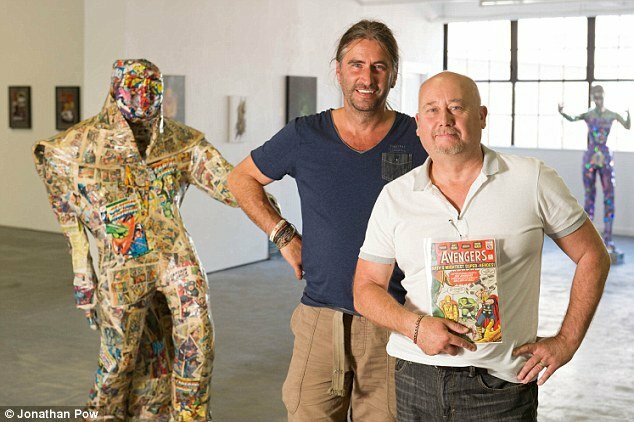 A comic book expert, Steve Eyre, attended the art opening and was shocked to discover the cover of “The Avengers” number 1 on the inside of the sculpture’s right leg. “Paperboy” was found to be constructed from a number of rare comic books. Eyre estimated the value of the collection to be somewhere over $20,000, that is, BEFORE Vickers used it as paper mache. The artist made headlines, here’s the story, but probably not the press he had hoped for. We share this story to reiterate how important it is to hire the right estate sale company. Vicker’s said ‘They don’t generally throw things out that are worth anything.’ The truth is that treasure can masquerade as trash. Often there is no great reveal, as the comic books had in Vicker’s story, as the treasure was never saved from it’s fate in the landfill. Even if the item steers clear of the dumpster the value, if unknown, is lost to educated buyers buying to turn a large profit. Give us a call before you begin to declutter, downsize and donate! When you hire Hunt Estate Sales you get a guardian, someone to protect and preserve your investment, for your heirlooms. While we’re talking comics here’s a shot of two cash wielding collectors purchasing a lot of comics Hunt Estate Sales found in a Somerville attic. The lot drew buyers nationwide as it included Green Lantern Number 1. Now THAT is how to write an interesting, informative article that also serves as excellent p.r.! Well done! Greate pieces. Keep writing such kind of info on your blog. Im really impressed by your blog. I’ve been exploring for a little bit for any high-quality articles or weblog posts on this sort of house . Exploring in Yahoo I at last stumbled upon this web site. Studying this info So i am satisfied to convey that I have a very just right uncanny feeling I found out just what I needed. I so much no doubt will make sure to don?t disregard this website and provides it a glance regularly. you’re in point of fact a good webmaster. The site loading speed is amazing. It sort of feels that you’re doing any distinctive trick. Furthermore, The contents are masterwork. you have performed a excellent process in this matter! Everything is very open with a precise clarification of the issues. It was really informative. Your website is useful. Thanks for sharing! Wow, that’s what I was looking for, what a data! present here at this web site, thanks admin of this web site. Wow, that’s what I was searching for, what a information! present here at this website, thanks admin of this web page. Hi to every one, it’s truly a pleasant for me to go to see this web page, it contains priceless Information. Thanks for another great article. The place else may just anyone get that type of information in such a perfect approach of writing? I’ve a presentation subsequent week, and I’m on the search for such info.